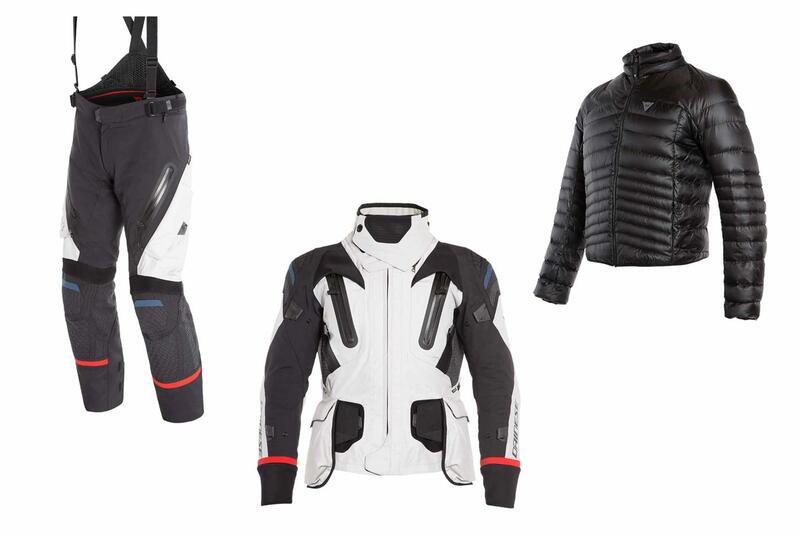 Italian motorcycle clothing experts Dainese have produced a new Explorer adventure and road touring range, designed to be effective in extremes of both hot and cold temperatures. Unveiled to the public during the firm’s first visit to the Cologne motorcycle show in 10 years, the new collection consists of multiple full suits, rainwear, boots, gloves and even travel accessories, including a bike cover and first-aid kit. During the design stages, the firm drew on their two years of experience gained when working with the Massachusetts Institute of Technology (MIT) on the biosuits for the astronauts going on the Mission to Mars programme, which is set to take place in 2030. Amongst the many new items of clothing is the Antartica adventure outfit, which consists of a £1299.95 jacket and £749.95 trousers. As you would expect for such a price tag, the suit is littered with features, including an external lumbar belt, which can be adjusted without opening the jacket, for a precision fit of the integrated Pro-Armor back protector. Alongside this, a new patented 'Trixior' material is present on the shoulders and elbows of the jacket, offering abrasion resistance to a Level 2 standard. A luxurious removable inner goose down jacket is also on hand to lock in the warmth in colder climates. Away from adventure riding, also included in the line-up is the more road-biased Gran Turismo jacket and trouser combo, which features a laminated Gore-Tex shell and direct-to-the-body zips on the chest to allow for greater airflow in warmer conditions. Priced at £949.95 for the jacket and £549.95 for the trousers, other features include a removable fleece, designed to also be worn off the bike at your destination, as well as an internal integrated lumbar belt. Much like the Antartica, a CE Level 2 back protector is also included. Alongside these items, Dainese have also updated their airbag technology to now include both a male and female-specific design, with separate systems available for both road and track use to cover only the parts of the body that truly need it.